The President, Shri Pranab Mukherjee at the Centenary Convocation of Lady Harding Medical College, New Delhi on September 21, 2016. The Union Minister for Health & Family Welfare, Shri J.P. Nadda and the Minister of State for Health & Family Welfare, Shri Faggan Singh Kulaste are also seen. Addressing the participants, the President, Shri Pranab Mukherjee said that centenary celebration is just not any occasion but an important milestone to reflect about your achievements and challenge. It an important milestone in the life of students, faculty and the Institute, he said. Congratulating the awardees, the President added that this speaks of their devotion to studies and academic excellence. This will also give an opportunity to provide solace and relief to the most needy. The President advised the young graduating doctors to be proud of the skills instilled in them by the College to face challenges of the competitive world. “Be Truthful, be virtuous, have compassion and never deviate from your own conviction,” the President advised the students. He further asked them to be learners, students, and innovators and researchers as they go forward in their profession. The President termed doctors as the most important component of the society, who have a tremendous burden on them to provide healthcare to the needy. He asked them to focus on providing their services in the rural and far flung areas to strengthen the medical infrastructure in the country. Speaking at the function, Shri Nadda stated that ‘health for all’ is a national goal and a priority for the Government. The Health Minister further added that ensuring the highest standards of medical education is a top priority and AIIMS-like institutions in different parts of the country are being established to set standards of medical education and healthcare at par with the best institutions in the world. “Existing premier medical colleges are also being upgraded with top class infrastructure and facilities. Medical teachers will also be closely involved in policy planning, regulation and enforcement of standards in medical education,” Shri Nadda added. Appreciating the Contribution of Lady Hardinge Medical College, Shri Nadda said that ‘Beti Padao, Beti Bachao’ is the passionate initiative of the Hon’ble Prime Minister, Shri Narendra Modi Ji, that is closest to his heart. “This historic institution of Lady Hardinge Medical College has been at the forefront of this movement for education and emancipation of women over a century – more than probably any other single institution in this country,” Shri Nadda elaborated. Addressing the participants, the Health Minister stated that the Government has grand plans for redeveloping and modernizing Lady Hardinge Medical College, to make it comparable with the best institutions in the world. Shri Nadda further added that the redevelopment plan with the super speciality block and other associated structures on completion will decongest the present campus; provide enhanced infrastructure for teaching and research, and wholesome environment for patients. Shri Nadda urged the students to not forget the larger purpose of always working to improve the health of the poor, the needy and the underprivileged. 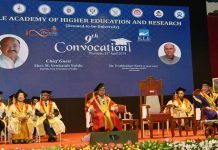 “No patient should be denied treatment on account of being poor or belonging to lower strata of society and I am sure, the students now being conferred degrees, in this Convocation, would carry forward this legacy of their predecessors and make their own name in the field of medical sciences and make the institute proud,” Shri Nadda said. Lady Hardinge Medical College is a landmark institution of this country. Being one of the oldest medical colleges for girls in India, its establishment predates the construction of Connaught Place, Parliament house and the Rashtrapati Bhavan. At the time of independence, and for many years after that, it was the only medical college in Delhi. The foundation stone of this institution was laid down by Lady Hardinge on 17th March 1914.The college has come a long way in the last 100 years, retaining its unique character, still marching ahead with the times and is upgrading itself dynamically in all its fields of activities. The institution is celebrating its centenary year with number of academic activities by each department. This will be followed by Founder’s day celebration on 23rd September where a commemorative stamp will be released by Shri Manoj Sinha, MoS Communications. Also present at the function were Dr. Jagdish Chandra, Director, Lady Hardinge Medical College & Associated Hospitals, Faculty Members, Doctors, Senior and Junior Residents, Students and other senior officers of the Ministry.